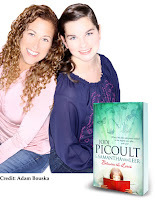 On Wednesday July 25th, a lucky group of avid Jodi Picoult fans got the chance to spend a couple of hours with Jodi and her daughter and co-author Samantha van Leer sipping tea, in the middle of Sydney Harbour. Fort Denison seemed a beautiful and fitting place to end their extensive international tour for their new book Between the Lines. Just like Jodi and Samantha our winning guests were a group of mothers and daughters who share a passion for soccer and great books. Arriving with their well-thumbed books, they were keen to learn about the origins of this inaugural collaboration. Samantha approached her mother with the idea of the fairy tale 3 years ago and Jodi was immediately interested. They started the project when Samantha was just 13, and worked on it during their summer holidays. The story line, plot and major characters were agreed over the first summer, writing side by side (8 hours a day!) over the second summer, and the third summer they spent together editing the text. Finally, this summer they are touring the world and enjoying the #1 position on the New York Times bestseller list! Co-writing a book is never straight forward but co-writing between mother and daughter takes it to a different level all together. Naturally there were some disagreements in the process of writing. Interestingly, one of them was over the tone of the novel. Jodi usually does not shy away from difficult and dark subjects, but it was her daughter who wanted the fairy tale component of their books to be as dark as possible. In the end they came to the compromise as Samantha got her dark undercurrents and Jodi managed to slip in some lighter elements ( like the unfulfilled pirate who really always wanted to be a dentist and… no we will not spoil it. You will have to read the story to find out what happens). However, there was no compromise when it came to the colour of Prince Oliver’s hair. Samantha always saw him as blond. But in the final version his hair is depicted as dark. It would have been a lot of fun to have been a fly on the wall during some of these “mother – daughter discussions”. It was a delightful afternoon, made all the more delightful by our members having the opportunity to meet these two remarkable authors. The Reading Room would like to thank all of you who entered our contest to spend time with Jodi and Samantha and to Allen&Unwin, Jodi’s Australian publisher, for making this event possible. Most of all we wanted to say a very special thank you to both Jodi and Samantha for taking time out of their valuable schedule to spend an afternoon with our winners. It wasn’t only the harbour that was sparkling! … and to those of you who were not so lucky as to win this contest; you are not entirely out of luck, you can still be a part of an extraordinary adventure, all you need to do is start reading Between the Lines. Also, don’t forget that you can join Jodi Picoult’s book club on our site and share your passion for her books with other readers around the world.